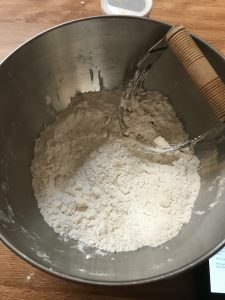 I love baking, and as part of this blog I thought I’d include some recipes I’ve tried. Today I tried this one, that I’ve never done before. I pinned it ages ago, and only just now thought to actually, you know…make it. 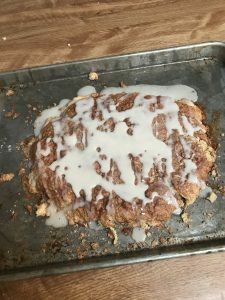 Cinnamon Scones. 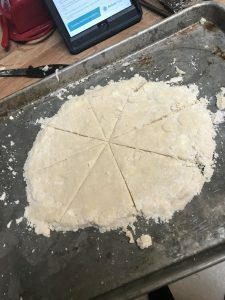 First you mix the dry ingredients, and then cut in the butter. I’m never quite sure when I’ve done this correctly. 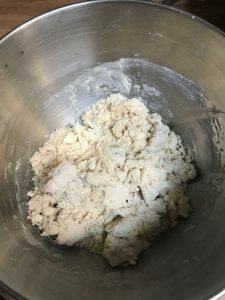 I don’t think I went far enough with it this time, because the final mixture (as you’ll see) was pretty crumbly and needed more moisture. If the butter was in smaller chunks, it would have held together better. See how dry it is? At this point I thought I should add more milk, but I don’t like to deviate from the original recipe the first time I make something, so I stuck it out. 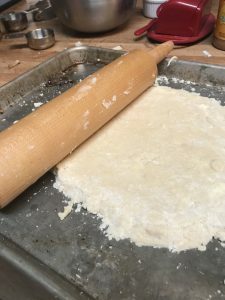 The neat thing about rolling something out on a sheet pan is that the edges are a set height, so when I rest my roller on it, I know I won’t roll something out to be too thick or too thin. It ends up even all across. This was still pretty crumbly, and I had to smoosh it together a few times. 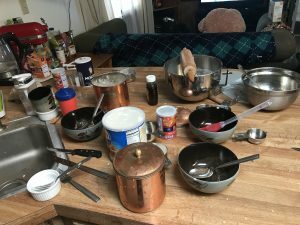 The aftermath of baking, lol! My poor husband. He likes it when I bakes, and doesn’t at the same time. It’s not as pretty as the original post, but it tastes pretty good! 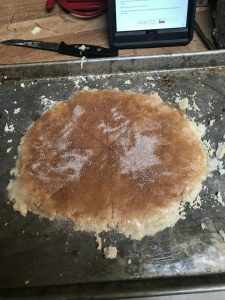 I think next time I’ll make the dough more wet, and maybe use a different kind of honey. The honey flavor is pretty strong. Still, it’s delicious!